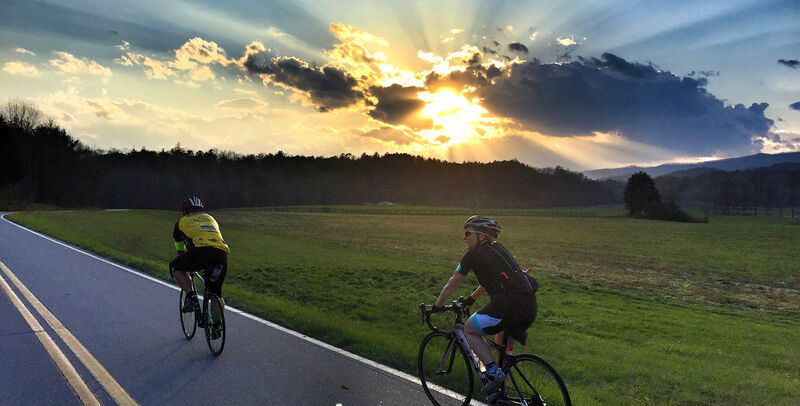 We have put together several local road bicycle rides in Western North Carolina and North Georgia. Please keep in mind that these descriptions have been submitted by volunteers and mileage is approximate. We will post updated information and ride descriptions as they become available. Details about weekly group rides can be found here. Circle the Bald – Hiawassee, GA – 34.7 Miles. This is the route for SABA’s annual Circle the Bald Ride. Ride the roads around the Brasstown Bald area and part of the same course that the world’s best cyclists ride during Stage 5 of the Ford Tour de Georgia. Be prepared for a very steep climb near the end of Owl Creek Road and a screaming downhill after the entrance to Brasstown Bald on GA 180. The route does not climb Brasstown Bald, but passes the entrance to the park. As a side trip, ride up to the parking lot of Brasstown Bald if you dare and enjoy the “Hors Categorie” climb! Tusquittee Road – Hayesville, NC – 3 Routes, 20-30 miles ea. Hanging Dog Loop – Murphy, NC – 25 miles. Approximately 25 mile loop, 2:15 hrs. to 2:30 hrs. advanced , 2:45 hrs. ride time for average riders. If you do this ride after the morning going to work or evening coming home there is very little traffic and for the most part are polite, thru the years have gotten accustomed to seeing cyclist.